As athletic shoe companies, fashion magazines, and the olympics are all trying to grab their piece of skateboarding i'm not worried about skateboarding at all. Your favorite brand, your local shop, your favorite skater... i'd be worried for them, but not for skateboarding. Skateboarding will be just fine. For every jock Koston there's a toothless Andy Roy balancing it all out. Skateboarding is an untamable wild animal that will never be successfully caged, but it is also a cannibal that will never reach a point of unity. Skateboarding lives in dog years. In 1 Earth calendar year, skateboarding has already lived 7 years. By the time the magazine cover with the skater wearing white sneakers has been delivered, black suede is already the look. As soon as games of SKATE rules establish no tricks where you put a foot on the ground, everyone's insta part has no-complies. Remember 3 years ago when that local hero did that thing down that rail? No. Because 2 new generations of skaters have started skating, that spot's a total bust now, 3 new parks have been built in the state, and 5 DIY spots have been demolished. Anything lasting 10 years in skateboarding is comparable to 70 years in any other setting - it has far exceeded it's life expectancy. That popular company that the local skate shop couldn't keep in stock 4 years ago is now out of business. What makes skateboarding so great is also what makes it cannibalistic and self destructive: that unyielding sense of independence. The attitude that draws us all in to this creative art-form where all we need is ourselves and a board also leads to situations like now with everyone thinking they want their own deck company. So the market is inundated with countless board brands all fighting for the same sized community. Smaller pieces of pie means smaller profits for most, pros making less off signature decks, less company profits to put back into skateboarding like contributing to local parks and events and videos. Skateboarding blows itself up, and before the smoke has cleared there's already a new plant growing up through the cracks in the pavement. So i'm not worried about skateboarding. It can take care of itself. The olympics occur once every 28 skateboard years. The athletic companies' deep pockets only have a finite amount of money - but skateboarding's creativity is endless. It really is that simple. Wood, metal, urethane... that's it. For all the hype, for all the trends, for all the opinions it is just the mix of three things. It's been those three things since i first stepped on one in the 1980's and it's still those three things in all the catalogs for next year's products from the manufacturing companies. Attach urethane to wood via metal and you will never be bored ever again. The cracked asphalt of a rest stop parking lot during a road trip stretch break. The curb in front of your grandmother's house. A parking block under a light post in the middle of the night. Sure skateparks and ramps are fun but with or without them, next year some kid is going to discover skateboarding and it's going to change their life. Warning: combining wood, metal, and urethane can cause an altered perception. Architecture suddenly takes on new perspectives and never looks the same again. Side effects include extreme bouts of creativity (sometimes lasting longer than four hours), personal insight, and occasionally a sense of accomplishment. Continue use at your own risk. Wood, metal, urethane... three ingredients, unlimited possibilities. Every year we head out to Long Beach CA in January to see the coming year's skate gear and footwear. i'm not sure which part i enjoy more: geeking out over the new decks, wheels, sneakers, pros, or getting to actually walk around in a t-shirt in January eating Pizzanista. 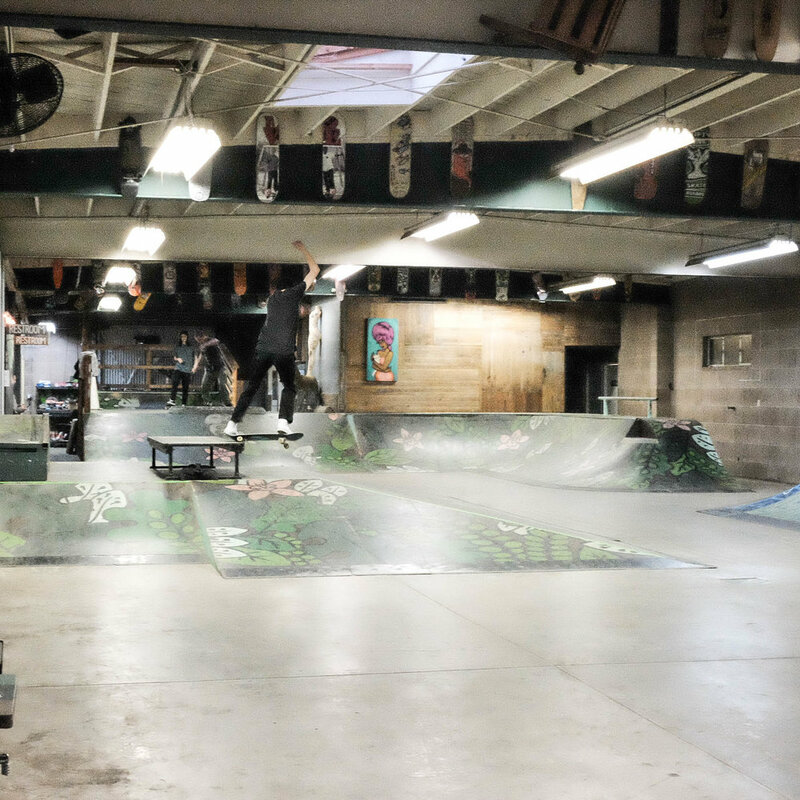 After all the trade show activities were done the crew at Skate One (Bones and Powell Peralta) invited us up for a tour of their factory/headquarters and were kind enough to let us come skate their local indoor private park. My 1st board was a Powell Peralta skull & sword and i have ridden more Bones bearings and wheels over the decades than i can count. Understandably i was too busy being a nerd watching the boards get pressed and the wheels get poured to take the camera so phase one - factory tour images are all Sarah's pics (below). Since LBS team riders Tristan and Jake have moved out to the greater LA area they joined us for the tour. As luck would have it team rider Gabe was out visiting while we were there so Maine was rolling in force, including Tristan's roommate (and fellow Mainer) Eamon. The guys at Skate One generously gave everyone in the crew a new Flight board and a place to test them out: Orchid Skatepark. The lighting was low this rare rainy day in CA and i didn't have a flash but i'll just call them stylishly effected. So here are Tom's Pics (below). Big thanks to the whole crew at Skate One! You guys are great!